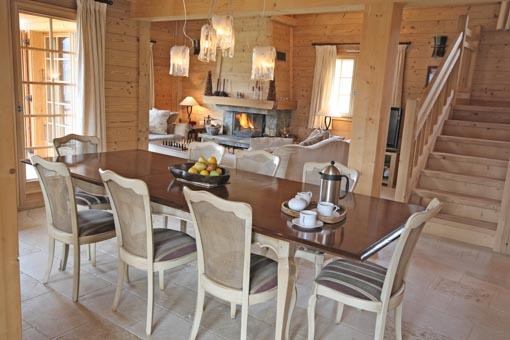 Chalet Iona is ideal for families and groups looking for a luxury retreat for their ski holiday. 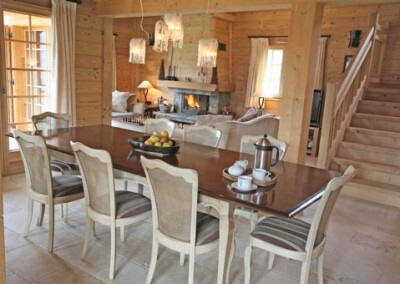 On the slopes of Mont d’Evian, it’s a lovely quiet location, away from the resort hustle & bustle, with breathtaking views of St Jean d’Aulps village and the Grande Terche ski area. It’s just a 5 minute drive to these pistes or 10 minutes to Ardent to access the rest of the Portes du Soleil. 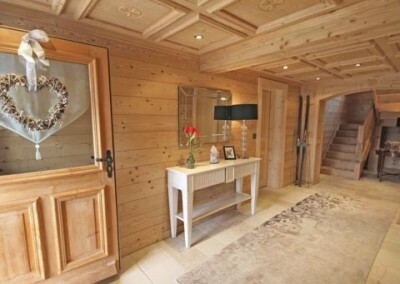 Chalet Iona is a stunning 5 bedroom ski chalet that was completed in 2007. It was built and designed as a family home and is decorated and furnished to an exceptionally high standard. 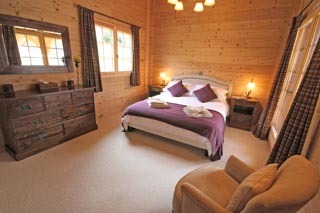 The chalet is laid out over 3 floors and offers spacious 5 star accommodation and breathtaking views. It’s your new home away from home in the mountains. The large open plan living & dining area gives a vast sense of space that’s further enhanced by the floor to ceiling windows on 3 sides of the room. Light floods in and you can easily take advantage of the magnificent views. Sinking into the deep squishy sofas with a steaming hot chocolate, the toughest choice you’ll face is whether to gaze into the roaring log fire or out at the incredible mountain panorama. There’s also TV with French & English channels and WiFi. There is a large dining area with cushioned seating for 10 people adjacent to the kitchen. 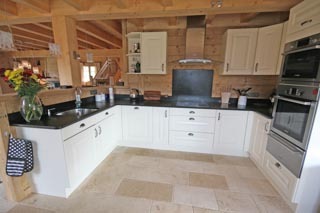 The kitchen is very spacious and fully equipped with all you’ll need, and beautiful granite worktops. 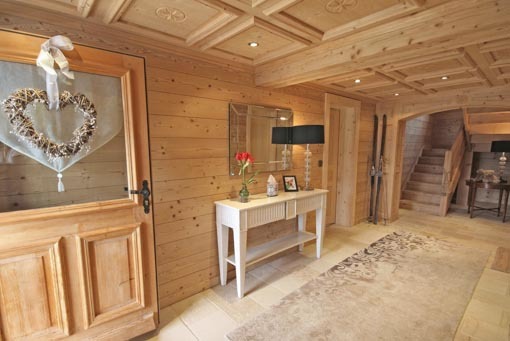 With wood throughout and beautiful exposed beams, Chalet Iona has a traditional Alpine chalet feel, coupled with a sense of space and homeliness that is often lacking in ski accommodation. For spring skiers and the summer holiday makers, the chalet has a large sun deck which opens off the kitchen, and balconies which wrap around the chalet. This is the perfect spot for an après-ski glass of bubbly admiring the magnificent views over the valley and of the surrounding mountains. 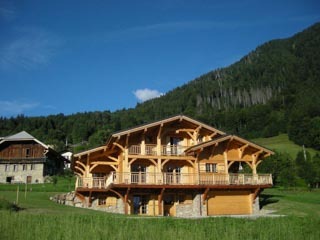 As the chalet has a south facing elevated position, it benefits from sunshine well into the evening in the summer months. 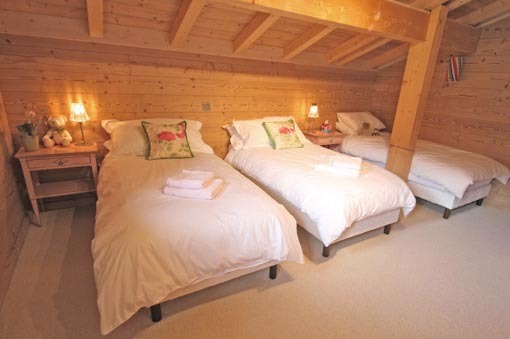 There are 5 beautifully decorated bedrooms, all en-suite, which can sleep up to 11 people. There’s plenty of storage space, and some even have comfy armchairs. 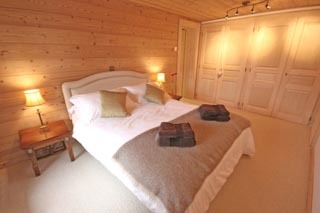 On the ground floor you’ll find a large double bedroom with ensuite bathroom & a twin bedroom with ensuite shower room. 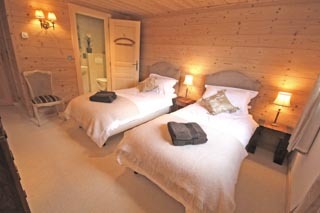 There is also a large double room with ensuite bathroom on the first floor that has direct access to the sun deck. On the second floor, is a large triple bedroom with ensuite bathroom and also the master double bedroom with a south facing balcony and large ensuite bathroom. Jo will meet and greet you when you arrive and is always on hand to help with any questions you have. 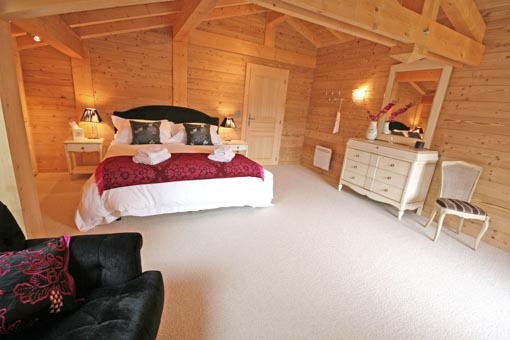 The chalet will be spotlessly clean for your arrival, and all beds made up with hypoallergenic duvets & pillows and Egyptian cotton linen & towels. Ground floor double bedroom with ensuite bathroom and windows opening onto the front garden. 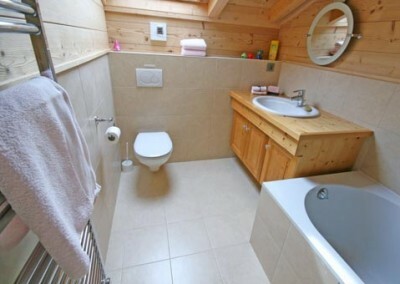 Ground Floor twin bedroom with ensuite shower room. 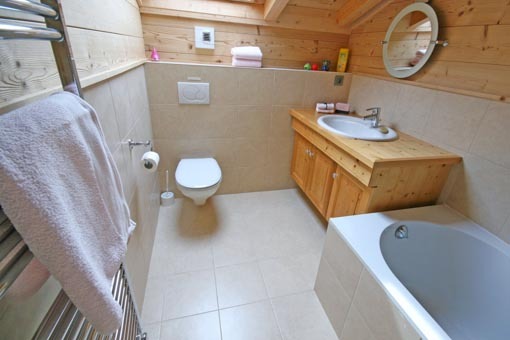 First floor double bedroom with ensuite bathroom and windows opening out onto the terrace. 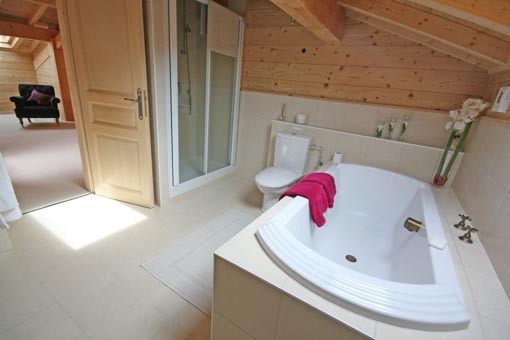 Second floor master double bedroom with ensuite bath & shower room. Double doors open onto a private balcony. 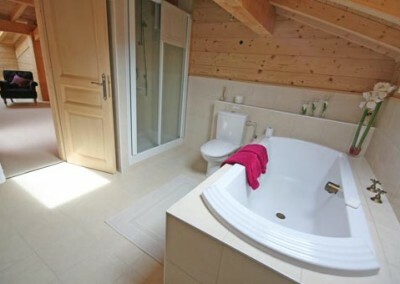 Second floor triple room with ensuite bathroom. 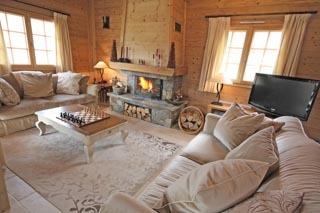 The chalet is perched high on the slopes of Mont D’Evian looking down on the charming village of St Jean d’Aulps and its ski area of La Grande Terche. 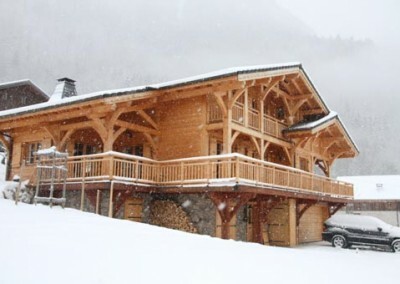 These slopes are just a 5 minute drive away, while 10 minutes takes you to the centre of Morzine, or to the Ardent network of lifts giving easy access to the Portes du Soleil circuit in any direction. Please take a look at testimonials below from previous guests that have enjoyed staying at Chalet Iona.